In August, Fleet Feet Sports and Mizuno partnered together to find people who inspire others through the power of running. Our community members nominated lots of wonderful people who inspire them to run and more importantly, to live wholeheartedly. We are celebrating and honoring the top 3 nominees for The Power of Running to Inspire! Each winner receives a complimentary pair of Mizuno shoes and their names have been submitted with all nationwide Fleet Feet Sports Power of Running to Inspire nominees. The national winners will receive a $500 donation to a charity of their choice and a video exposé on their inspiring story. Our celebration will begin with a Mizuno hosted Thursday night 3 mile run at Fitzgeralds 1928 Tavern. Everyone's welcome to join in, runners and walkers alike. Following, we'll enjoy food & drink at Fitzgerald's Sidecar and share the stories of these deserving individuals from our very own local running community. You will walk away inspired. Guaranteed. ...is a determined runner who continues to overcome obstacles; some so huge most of us would have thrown in the towel a very long time ago. Enduring the grief of losing her husband to the September 11, 2001 World Trade Center terrorist attack, Beth ran to help her cope with the pain and to deal with the stress of raising 2 children alone. 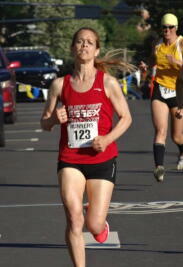 In 2008, diagnosed with Crohn's Disease, Beth's running focused on staying healthy for her family. She continues to break through new challenges and is an inspiration to everyone lucky enough to know her. 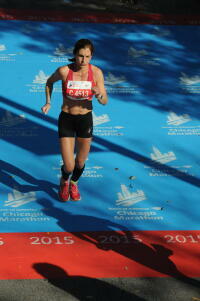 "...For me, running a race is a great metaphor for life. At some points you feel great - other times, you feel like you can’t possibly take another step. Sometimes you find yourself running with someone - other times you’re alone. 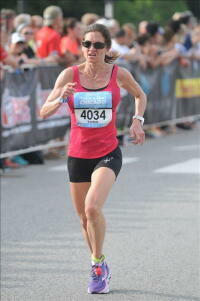 But that feeling of accomplishment you get when you complete a great run or race can be truly powerful." Jacqueline, who works as a Coordinator at Covenant House, a 40 bed homeless shelter for youth age 18 - 21, has introduced running to her young people as a tool to build self-confidence and empowerment. "Together we have celebrated 5K victories, and I could see how proud they were about crossing that finish line." On September 18th, 2016 Jacqueline ran her first Half Ironman in Atlantic City to raise money and awareness for homeless, abandoned, abused, trafficked, and exploited youth that Covenant House supports in 27 cities across America. Running has helped Jaqueline feel a tiny degree of resilience and endurance that she recognizes in the youth she works with everyday. ..."Not a day goes by that I don't say a silent thank-you to the community of Fleet Feet, which I credit for bringing me back, literally from a wheelchair. 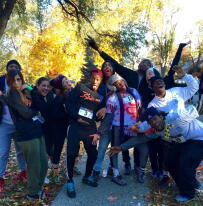 The camaraderie and fortitude of the running group and the people that I sought out in my recovery were MY inspirations." and one-foot-in-front-of-the-other determination Rebecca continually exudes. In 2011 Rebecca was crossing a busy street when she was hit by a car, breaking her pelvis, her arm and suffering a concussion. 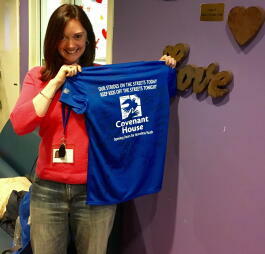 Rebecca's life time dream of running a marathon NO MATTER WHAT became her focus as she spent months in a wheel chair. She read every book she could get her hands on. 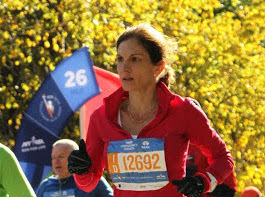 Her attention to healing her broken body was connected to her mind’s determination to do that marathon. It took her months to return to walking. 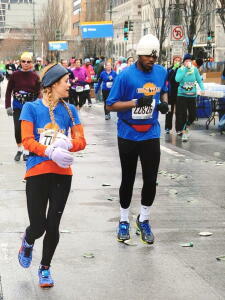 She then graduated to running a block or so with Fleet Feet's Sunday morning group before having to stop. 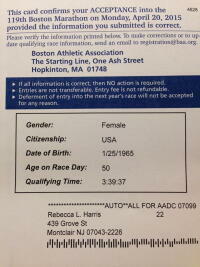 And nearly a year after the accident Rebecca ran a 3:38 marathon, qualifying for the Boston Marathon. 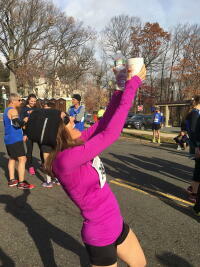 Everyday Rebecca reminds us all of transforming power of running and a positive mind! 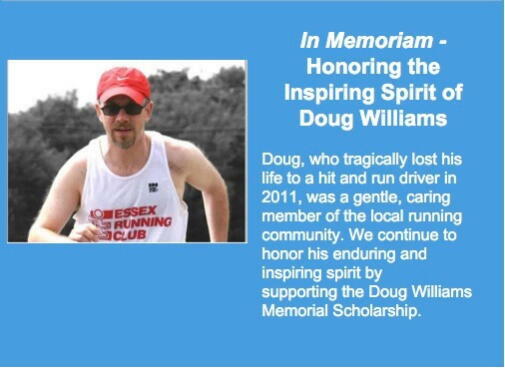 Each year since the death of our dear friend, Doug Williams, the running community joins together to honor his memory through the Doug Williams Memorial Scholarship. Seniors from Doug's alma mater, Montclair High School, are selected for the scholarship based on the following criteria: outstanding participation in track & field /cross country - academic excellence - leadership and community service. 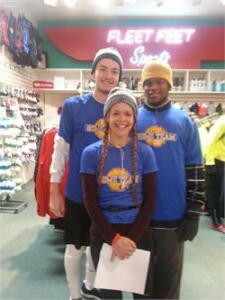 All proceeds from The Power of Running to Inspire celebration will be contributed to Doug's scholarship fun.